It's better with two! 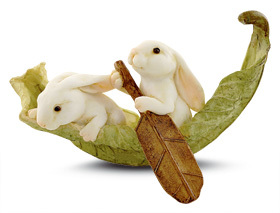 A pair of bunnies head for an afternoon's outing in their leaf boat. 3 1/2" long. They would have looked much nicer if they had the usual shiny ceramic finish. It shows they are of a porous finish. I already have another set of three little rabbits and will order more. They are mystical to me. Little joys. Gave the bunnies to my daughter for her birthday and she loved them. I have looked at the bunnies for a long time and decided to purchase. Well worth it. This was a gift for a friend and she really liked the very cute bunnies!! These are so cute, just like the are in the catalog and even better, I love them. They arrived on time and were well packaged. Very cute and unusual great sale price,too. Delightful creatures will be a special gift for someone who cherishes Nature's wee beasts! This is so cute...wish it were a little larger. It is for my son and daughter-in-law who are buying their first home. Wrote them words from "The Water Is Wide"...very appropriate.